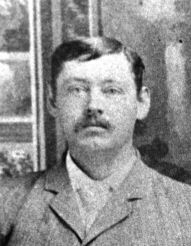 Rex Oral McGinnis (4) moved from West Virginia to Texas with his parents when he was five years old, as his father E.M. McGinnis sought land to farm. His aunt Melcena remembered him as a remarkable child. He began earning money for his parents when he was 13. As a young man, from 1903-1906, he trapped for furs. He almost froze to death in a freak Texas blizzard, only finding his way home on horseback by following a fence. He signed business postcards, "Yours for just assortment and full value" and printed up envelopes "R.O. McGinnis & Company, Dealers in Raw Furs and Skins." He signed letters to his parents, "Your devoted son." In a poem for his mother Addie Lawson, he wrote, "...Let the goddess of science supply every need/And deprive me of a mother's love/T'would be a dreary world indeed." R.O. 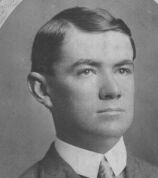 McGinnis attended high school in Alvin for a year or less. 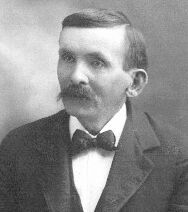 He graduated from the Galveston campus of Draughon's Practical Business College on Sept. 26, 1904 earning more than 90% in each subject except spelling (88%). He got a 98 in deportment. He studied business arithmetic and penmanship but not typing or shorthand, though he became an accurate typist. When he grew up, Rex moved from Katy to Houston to better support his family. With his brother-in-law R.E. 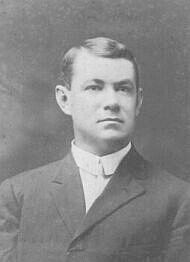 Lovejoy, he established the Rex Electric Company "Armatures a Specialty," but the endeavor apparently didn't last long. For much of his career Rex was a power plant engineer, running steam turbines to generate electricity. A July, 1906 letter found him at Fulshear. In 1907 he lived at 1908 Decatur St. in Houston, where his sister Kittie wrote, "Why on earth don't you write?" (something she asked him several times in his youth). In October 1908 he was at 304 Bayou St. in Houston. In 1911, he lived at several Houston addresses, but by December 1911 he was providing power for the Brazos Hotel, where he also lived. As late as February, 1916, he was still in Houston, at 1413 Franklin Ave.
Not many months later, Rex was at the Freeport Sulphur Company, working as a engineer at Bryan Mound south of Freeport and then at Hoskins Mound north of Freeport. He married Ruth O'Bryan in 1917. The next year he suffered a serious knee injury which kept him off the job and gave him time to write little nonsense rhymes for his wife ("With a merry laugh and song, she tats all day long.") Ruth had to start the car for him, getting out in the mud to crank it. If the mud was deep, she had to turn the crank through the mud. He never completely recovered from his accident. Even in 1930, he wrote,"My bum leg improves slowly," noting that his knee had stayed in place for a year. In 1931, he commented, "Just lately my left shoe commenced to wear out for the first time since my trouble." Rex and Ruth lived for more than 20 years in Freeport, TX on the Gulf Coast. When the house was built, they had been assured that a road would soon be laid between the house and the levee. And eventually the road was built -- twenty years after they had moved away! So, looking out their front door you would be facing the levee, with the Brazos River just on the other side of it, if you wanted to swim there. The railroad tracks would be about a block to your left, with downtown Freeport several blocks to your right and Bryan Beach on the Gulf of Mexico behind you some miles away. Since there was no street in front of the house, Rex and Ruth drove up to their house through the alley behind it. The house was probably located around First Street, perhaps on part of the large property now occupied by Marine Industrial Supply. Rex and Ruth took several long vacations. In 1934 they traveled 3,300 miles out west, seeing Clayton NM, Taos, Las Cruces, Carlsbad, Pecos, San Antonio, Cinnamon Creek and the Rio Grande Valley. They also went to the World's Fair in Chicago. 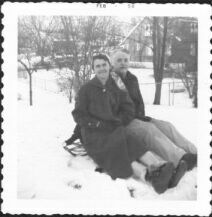 In 1951 they visited West Virginia again, where with cousin Herbert McGinnis they saw David Allen McGinnis' old home and grave and attended a McGinnis Clan Gathering. They also visited their son (and grandson) in Albuquerque, NM in 1959. Rex stayed at the sulphur company for more than 20 years. His letters frequently report the news from work, especially the layoffs during the Depression. He told his mother in 1931, "Glad to hear that you have lots of good things to eat coming up, also chickens and eggs. If I am out of work, can help you eat some of it." For unknown reasons, in 1939 he had a nervous breakdown, spent some time in an Arkansas rest home, and got a medical retirement and pension from the sulphur company. After that, he began looking for a new place to live. During the summer of 1939, he moved his family to Concan, near the Frio River. Wildlife was abundant, Maureen and C. David fed the squirrels and goats, and the landlord left them six hens. Rex wrote, "Charles David says he has so many pets he does not know what to do with all of them." The house had no running water, refrigeration or electricity. The well was 100 yards from the house. The washing machine ran on gasoline. Rex's health suffered from trying to live off the fresh fruit and vegetables that peddlers brought them about three times a week. One offered him 50 lbs of fresh bermuda onions for 35 cents. They also shopped at the city market when in San Antonio. David slept in a screened-in porch. He was fascinated by Mr. Whitney, a traveling cowboy, who began visiting the family on horseback while they lived in Concan. 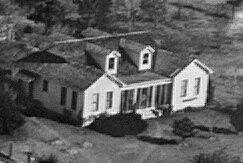 The next school year, 1939-1940, was spent in Boerne, on East Blanco Road not far from today's post office. The McGinnis family had Judy the goat "for her care," which meant abundant goat milk for allergic, sickly Charles David. "The boy is very fond of her," Rex wrote. Rex and his family grew onions and other vegetables in their garden. Rex told his mother that he was seeing a chiropractor and missed his radio. Maureen attended school. Then, in 1940, Charles Stockdick, the husband of Rex's sister Kittie, offered to sell Rex 160 acres of land under favorable terms, and he agreed. When the McGinnis family arrived, the property was bald prairie, and Rex planted every tree that now grows there. The farmers to whom Rex leased the land switched from peanuts to rice soon after Rex bought the land, and in recent decades, most Katy farmers have gone from rice to soybeans. C.D. McGinnis remembers the farmers shocking the rice in the field, just as in the olden days. Rex contracted with the lumber company for the wood, and did all the plumbing and electrical himself. When the pretty white house on Franz Road was finished, it was considered so nice that Katy Methodist Church asked to have a church social there. One reason was that it had indoor plumbing, which was unusual at the time. 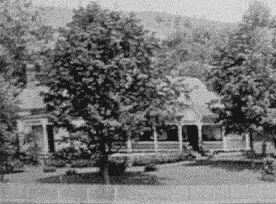 C. David McGinnis was raised in this house, and later named it Seven Oaks, after the large trees along the front of the lot which Rex planted from acorns when they moved there. Behind the house, two miles from Katy, Rex kept a garden, chickens, goats and some cows (which he milked). When a goat would get her head caught in the fence, he would whack her with a board (something he never did to his son). C.D. McGinnis remembers looking at the dinner table and thinking, "Everything here came from our land." During World War II Rex was the town plumber in Katy and he also had some rent houses, including the old Katy Hotel which was turned into apartments (about four of them). He was truly ambidextrous. When he tired of painting with one hand, he would switch to the other. He was always a frugal man, repairing his same car until it stopped running. Shortly before he sold the old home place south of Katy, he reclaimed part of the kitchen, some bois d'arc fenceposts and other wood. He used this lumber on a small second house at Seven Oaks. At one point he gave his father all his savings and he once advanced his niece Les some college funds. But sometimes, like his father E.M. McGinnis, he seemed obsessed with running out of money. However, Rex did not skimp on what he ate -- "good food and lots of it." He always expected a lemon meringue pie for his birthday. Les remembers Ruth's exquisite crab gumbo, but you had to remove the shells yourself. He had an unusual sense of humor -- Example: "Are you through eating? Then I'll get a hammer and knock out your teeth." Or if David had trouble cutting his meat, Rex might advise, "Put your foot on it and growl." He had a fairly high speaking voice, but when he sang hymns in church, he would quietly rumble along tunelessly as many men do. While his wife enjoyed classical music, he liked "hillbilly" music. He spoke so loudly on the phone that his son jokes that he didn't really need a phone to be heard in the next county. At five eight-and-a-half, he stood half an inch shorter than his wife. He enjoyed fishing and owned some good lures. As a young man, Rex wrote religious verses and often attended special revival meetings, in the tradition of his godly West Virginia ancestors and relatives. He did not allow smoking, drinking or gambling in his house, and reluctantly allowed his son to attend dances (but not to play Dixieland sousaphone for them). In 1943 his Aunt Mord (Lawson) wrote, "I judge that you are a Christian." His sister Kittie invited him to a 1908 meeting led by Charles Parham, one of the earliest American Pentecostal preachers. Eventually Kittie became part of that movement, while he did not. In 1926 she and her husband Charles Stockdick even spent some time as itinerant preachers. The Apostolic Faith Church in Katy, which follows in Parham's tradition, began in a Stockdick warehouse. C.D. McGinnis visited the church at least once as a boy, but his parents disapproved of it. As his sister Kittie slowly became more mentally unstable and careless with her money, Rex and Ruth found thousands of dollars in uncashed checks lying around her house. Rex petitioned to have her placed under his own legal guardianship. He was afraid that the personal doctors and Apostolic preachers who always hovered around her were trying to take advantage of a wealthy, senile woman. 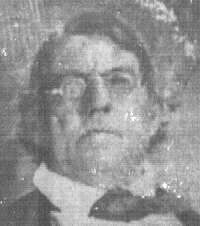 Even so, some some influential members in his own Katy Methodist Church suspected him of being more interested in preserving his own inheritance. Because of such accusations from his own church, Rex asked for his letter of church membership back in the late 1950's. Les King took over responsibility for her aunt later. In 1960, Rex was diagnosed with acute leukemia and given only a few months to live. His son David was already moving back to Texas. There were no tearful farewells from the dying father, but then, Rex never had communicated his feelings readily. C.D. McGinnis only remembers his father saying, with a catch in his voice, "Well, tell the boy I love him," meaning grandson Michael McGinnis. There were no expressions of regret from the son, for Dave knew he had loved and honored his father. On July 30, 1960, Delsie's husband George Herron called Dave to tell him that Rex had died. 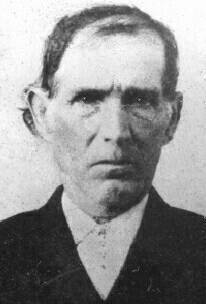 Though Rex was no longer a member of Katy Methodist Church, his body was returned there for his funeral. All three of Rex's grandchildren, and his ten great-grandchildren, live in or around San Antonio, Texas. Ruth O'Bryan (5) was orphaned in 1912, at age 17, and took over housekeeping for her brothers. Raised in Vermilion Parish, LA in the home of her father Oliver Henry O'Bryan, she taught her son how to say in Cajun French, "You bad boy, I'm going to whip you, yes! ", a phrase she often heard her neighbor say while she was growing up. She never studied past the 7th grade. 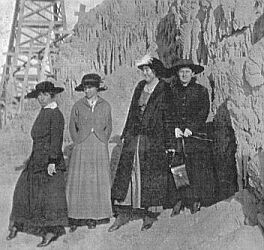 Photos taken in the 1910's show that she was a leader in fun and frivolity among her girlfriends, dressing up and posing for snapshots. Even in her school photos, the pretty, dreamy-eyed girl appears the center of attention. Tall and slim as a young woman, she stood five foot nine. 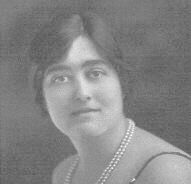 She learned to play the piano from her mother Ruth Abigail Nourse. Les King remembers that Ruth loved to sing Irish songs such as "When Irish Eyes Are Smiling," while C. David McGinnis remembers that "I'll Take You Home Again, Kathleen" was a favorite. Besides being an excellent cook, Ruth grew all sorts of flowers. Some of her bulbs still grow in Les King's garden in Houston. Ruth was living in Freeport by 1917, where some of her brothers worked for the Freeport Sulphur Company with a bachelor named McGinnis, who was in his early 30's. He had noticed her and was asking the O'Bryan brothers for an introduction. Since they were planning a party, probably at the beach, she retorted, "Oh, why don't you invite that old, fat McGinnis and ease his pain?" 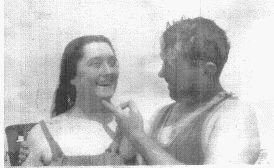 They did, and Ruth and Rex McGinnis were married on December 21, 1917. 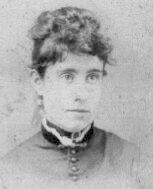 Her aunt Jennie Putnam wrote to congratulate her, "If you put God first in your lives, you will find that all will go well." Les King remembers that Rex always kissed Ruth when he came home from work, and occasionally one would see him touch her affectionately, not a common thing in those days. At first, probably because of work and housing pressures, the new couple couldn't even see each other very often. Rex writes, "Pet, it seems you are a long ways off and when I come to see you, I am so tired and sleepy that I am not jolly at all am I honey bunch? Bye bye dear wifey, your devoted husband Rex." He wrote poems for her, including, "Oh destiny! thy mystic name/That thou mayest weld our hearts together./And with friendship as a golden chain/May the link hold fast forever./May each passing day/Forge a link in our friendship's golden chain/And may these lines bring/The 'pleasant moments' of the past to light again." Bad weather almost prevented them from spending their first Thanksgiving together in 1918. Ruth wrote on November 16, "My own dear husband, how I miss you. I have just lots to tell you. Have a secret but won't tell you til you are here. I know you will be glad for you are very fond of it. So come get your share while it lasts or I'll make away with it all. Be sure to come in the morning." Rex didn't make it that week, but ten days later, he wrote, "I want to eat Thanksgiving dinner with my wife, something that has never happened yet to me. How are you feeling?" The house in Freeport became the summer home for many nieces and nephews, including O'Bryans and Lovejoys. Les King remembers waiting for the company shuttle train to bring her Uncle Rex home after work so they could go to the beach and eat a picnic supper. Sometimes the adults would have a seining party. Les describes it: "About ten or so of the men would take a huge seine out into the water and drag it in, usually, filled with all kinds of seafood. The men would clean the fish and the women would fry them over a big campfire." Storms have changed the Gulf beaches now, but in the 1920's the Freeport beach was as "wide and wonderful" as the Surfside beach is now. Once Ruth had a pirate's treasure party for Les at the beach, and one Christmas at Enoch and Addie's house, Les received "a lovely 'lady' doll for which Aunt Ruth had sewn a complete, elegant wardrobe with silk and fur and all." Ruth was christened as a Catholic at St. Mary Magdalene's Church in Abbeville, LA, but was raised Episcopalian after her father's death when she was 10. Though married to the grandson of a Methodist preacher, she remained loyal to the Episcopal Church, saying that John Wesley never intended to start a new denomination. In Freeport Ruth was responsible for the altar flowers and hangings at St. Paul's Episcopal Church. Whenever Bishop Quinn was in town for a special service, he always had dinner at the McGinnis house, "probably because Aunt Ruth was such a marvelous cook." Ruth took C. David and Maureen McGinnis with her to church in Freeport, but in Katy, because there was no Episcopal church, the family attended Katy Methodist together. When Ruth visited her brother Francis in Houston, she attended the Episcopal church with his family. In March 1926, Ruth became so sick she didn't eat for 18 days. Her weight dropped to 153 pounds (Rex weighed 171), and it cost $100 a month to care for her. She had recovered by May and wrote to her sister-in-law Kittie, "I had been sick so long I was really getting discouraged, and your visit to us was a blessing to us all. Your faith strengthened mine and I am sure the Lord always hears the prayers of those that have faith. I do praise Him and thank Him." 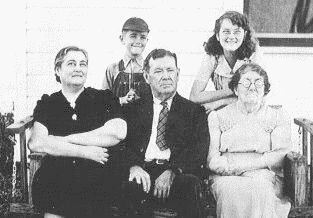 The couple had no children until, about 1929, they went to an orphanage in Houston and picked out a two year girl named Maureen to adopt. Rex thought the baby looked like him. When she was seven, she started piano lessons. Their son Charles David McGinnis was born in 1935, when Ruth was 40 and Rex was approaching 50. Two years later, Rex wrote, "He is the source of lots of pleasure to us." He listed for his mother Addie all the things the little boy could do, including reporting when the onion tops in the garden had fallen over. An older woman helped take care of David for years. Maureen left home at an early age and married young. After C.D. McGinnis reestablished contact with her in 1976, he visited her every year in New Mexico until her death in 2002. After Rex's death in 1960, Ruth lived very briefly with her son in Richardson, then found a house nearby. Sometimes she would babysit her small, energetic grandsons Michael and Mark McGinnis. Michael remembers her serving them macaroni and cheese with applesauce and telling them to "Eat your dinner." She lived in Houston after marrying George Herron, the widower of Rex's sister Delsie. When she moved to Woodland Hills, California about 1970, she stayed with Mrs. Wier. She attended the Episcopal Church right behind Woodland Hills United Methodist Church, where Michael remembers her light, trained singing voice. When four-year-old Marilyn McGinnis Loree would go to spend the night, she slept in Ruth's bed with her, and Ruth always had a present for her. Michael McGinnis rode his bicycle once to see her, enjoyed the visit, and always planned to do it more often when she returned from a visit to Houston. But during the flight back from Houston, she suffered a heart attack. When she arrived at the airport, she was in a wheelchair, pain showing on her face. There was barely time for her grandchildren to kiss her before she was rushed to a hospital in Van Nuys, CA. She died on July 23, 1970. She is buried beside her second husband George Herron in Lot 145, Garden of Peace, Forest Park Cemetery, Houston.